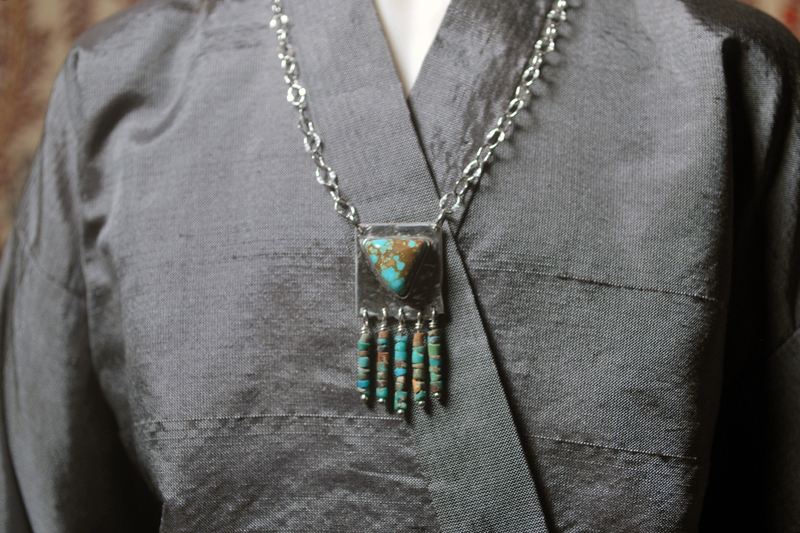 We hope you liked the turquoise we first offered in March, because we have more! We have made some fine friends in the lapidary world and suddenly we have an incredible source for some unique stones that are cut in a scale that is small enough for dolls. In this release is an elaborate multi-layer necklace featuring a fabulous Indian Mountain turquoise, another necklace featuring an old stock No. 8 turquoise, a very exciting statement ring with a rich blue Middle Eastern turquoise, a Kingman turquoise on our classic floral motif band, and a Utah variscite cuff bracelet with tons of personality. Also in this release are the first pieces made using another fortuitously acquired stash of beautiful gemstones – an opal floral ring, a mother of pearl necklace and a dramatic, moody labradorite and etched copper plaque. You can see it all here! As a side note, a new ring has been added to the Etsy shop as well.